All Teckentrup folding doors are part of a compact product range based on standard product features. Whether single or double-skinned: All our doors have standard connection systems and fittings and thus display the same optical design. 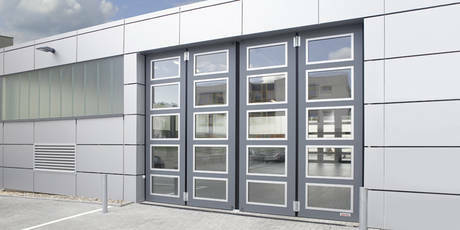 Teckentrup folding doors are used in a whole host of applications, e.g. large maintenance or equipment halls, vehicle depots and other manufacturing environments, and are adapted to the individual building requirements.